L'oeuf cosmique 1941-46. Drypoint, 25.2 x 20.6 cm. Art Gallery of Ontario. 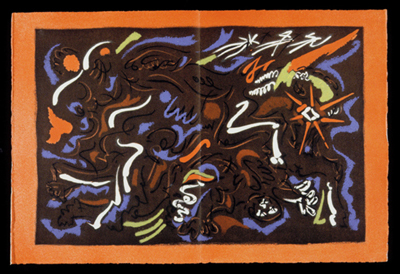 From its beginnings in the 1920s, André Masson (1896–1987) was a key figure in Surrealist art. He was a pioneer in the techniques of automatic drawing and biomorphic abstraction. Collaborating with Surrealist poets and theorists in their quest to subvert reason and investigate the workings of the human subconscious, he contributed illustrations to many important works of Surrealist literature. His fascination with metamorphosis in all its forms not only informed Surrealist thought, but provided the fuel for a lifetime of creativity. Masson's complex, poetic and psychologically charged works comment on his struggle against Spanish fascism in the 1930s and his American exile from Nazi-occupied France in the 1940s. In the 1950s, he began to draw on Asian traditions and the Impressionism of Claude Monet and J. M. W. Turner. 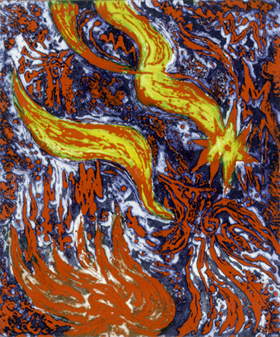 Masson's boundless creativity is revealed by his experiments with printmaking techniques across the six decades of his artistic career. André Masson Inside/Outside Surrealism: Works from the Gotlieb Collection presents a comprehensive collection of over ninety works by André Masson. Allan Gotlieb, former Canadian ambassador to the United States, carefully gathered only the finest impressions of Masson's prints and illustrated books. Organized by the Art Gallery of Ontario and curated by Michael Parke-Taylor, this is the first public exhibition of the Gotlieb collection. 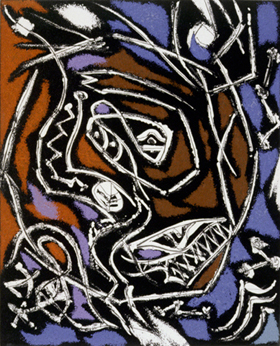 Les oiseaux sacrifiés 1954. Etching and aquatint. 30. 9 x 25.8 cm. Art Gallery of Ontario. André Masson Inside/Outside Surrealism will have its premiere at the McMullen Museum of Art, Boston College, and then will be shown at the Art Gallery of Ontario this summer. The McMullen Museum will offer a series of public programs to accompany the exhibition, including readings from Surrealist literature, an evening of short Surrealist films, a concert of Modernist musical compositions, and a Surrealist games night. The Museum's docents offer free public tours of the exhibition every Friday at 12:30 pm. Private group tours are also available on request. To schedule a tour, call (617) 552-8587 at least two weeks in advance. An introduction to Masson's life and work is available here; click on "Learn More about Andre Masson" at the right of this page. In addition, the Romance Languages department has developed an online study guide to Surrealism for high-school and college students of French, to be used alone or in conjunction with a visit to the exhibition at the McMullen Museum. The 96-page hardcover catalog published by the art Gallery of Ontario includes essays by the curator, Michael Parke-Taylor, and Masson scholar Laurie Monahan of the University of California at Santa Barbara, as well as color illustrations of 30 works from the exhibition. Une saison en enfer 1961. Etching with aquatint, 38.2 x 57.0 cm. Art Gallery of Ontario.